A big brand name (Verizon) and a robust media-management ecosystem have helped establish Verizon Digital Media Services (VDMS) as one of the early leaders in live sports-content distribution and management in the rapidly evolving OTT and DTC world. In 2017, the company delivered more than 45,000 live events for clients and partners of all shapes and sizes. 2018 is expected to be even bigger, with the company projecting more than 60,000 hours of live content. At NAB 2018, VDMS showed off its Live Event Operations managed service, demonstrating how it helps content owners better manage the complexities of the rights and monetization of their content in an OTT environment. 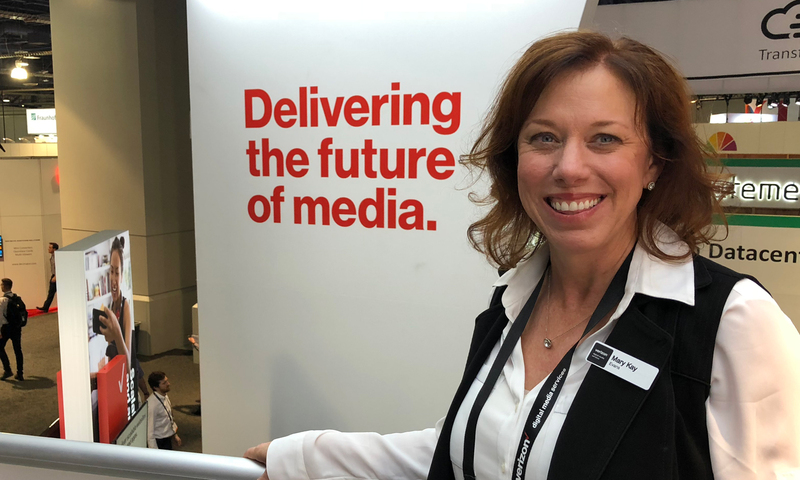 On the show floor, SVG caught up with Mary Kay Evans, chief marketing officer, Verizon Digital Media Services, to discuss where she sees the OTT industry evolving and how her company’s services help make digital rights and video distribution much easier to manage. How has ad insertion and monetization in OTT environments matured over the past year, in your opinion? I think there are two things happening there. Back in the day, there were slates [during commercial breaks] because they just simply weren’t selling the ad slots. That was the reality. I think that’s all gone now. It’s taken a long time, and OTT is still in its infancy. Although I do think, from looking around [at NAB 2018], it’s definitely taking off. 2018 and 2019 are going to deliver what everyone has been predicting. We can see the adoption rates. The ad slots are being sold, and there’s inventory. So going to a slate isn’t going to happen, and a big part of that is because the audience is there. More and more people are watching live sports over-the-top. The quality is there. Sports is hot, and it’s not cooling off. And when it comes to live, it’s all about sports, and there’s no second chances. Are there still technological challenges that Verizon Digital Media Services is battling? What are the keys that are common pain points? Everyone is facing the “time-behind-live” challenge. There are varying degrees of how different vendors can get faster and faster. That’s a huge focus for us. The closer you can get to live, the better off our customer will be. It’s the situation where you are behind your neighbor and you hear them cheering; now you know something is going to happen. That’s not a good experience. We’ve come a long way, and we’re paring that down all the time. We want to be at live. That’s our goal. The truth is, even satellite broadcast is behind live. There’s latency in every medium that you view and have content delivered by. To get everything in the entire ecosystem in sync? A huge challenge. Another challenge that also remains is regional blackouts and content rights not only for the content itself but how it applies to advertising as well. That’s definitely where VDMS stands out over so many of our competitors. That’s all baked into our platform. Instantly, we can handle content rights on the fly. It goes along with the server-side ad insertion. The ads are stitched into the stream, but we already know where the viewer is and what ad they should be seeing.